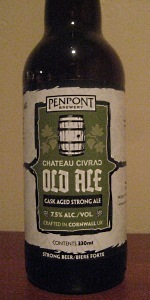 Description: Brewed in the tradition of “Old Ale”, where English ales were aged in wooden casks, this beer is the result of a collaboration with Chateau Chivac – a Bordeaux winery with Cornish connections. It begins with a strong ale that is aged in oak wine barrels and fermented with wild yeast to achieve a complex flavor. Tasting Notes: This is another offering from the Craft Beer Advent Calendar, and it was interesting for sure. While not what your average Pacific Northwesterner is used to (i.e. low carbonation, little foam, very subtle hops) there is plenty here to appeal to the beer enthusiast within. A good malt base, sweet notes, mild hops, strong oaky notes, and some distinct traces of red wine tartness and body (which may also owe to the accumulation of wild yeast strains) make it an all-around worthwhile experience.